Howdy! To all of you who don’t know me yet, I’m Denis a.k.a. Denis Lucky. The nickname stuck many years ago after a rafting guide in Indonesia tried to pronounce my last name, failed miserably and decided to use something similar but intelligible. What you see today resulted from a series of both coincidences and regularities of my entrepreneurship that had started a long time ago. Being a passionate and devoted collector, I spent all my school years searching for, trading, buying and selling collectables: coins, postage stamps, badges, stickers, toy soldiers and such-like. Already at the age of 14, with my longstanding experience in transactions at swap meets (garage sales/flea markets), I launched a project that may have changed my life forever. I started selling milk. But not in a grocery store, nor on a stand in the street. I borrowed my grandpa’s cart and started catering in the vicinity, delivering milk directly to those that made preorders. I’ve learnt to size up the potential customers by how clean their windows are, by neatness of the front doors and flower beds in their yards. I did not always assess my customers correctly, but mistakes were quite rare. It was then that I learnt about piece goods, individual approach and mutual loyalty. Now, many years past, I smile when I remember my setbacks and shards of dropped milk bottles, and I’m immensely thankful to the people that believed in a young man with a wide smile! 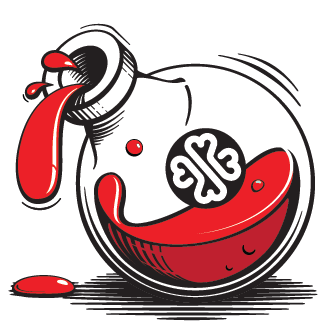 In the beginning of 2017 I launched the Lucky Syrup brand, a result of many changes in my life: the move to Berlin, plunging into the world of modern illustration, the ability to do what I really wanted to. This was the case when a hobby grew into something more profound. Symbols of luck, positive and mocking images hide behind the Lucky. The Syrup was added as a condiment, not quite edible by itself but making the dish tastier and more appealing. Just like our t-shirts that cannot supplant their owners but can make them stand out, accentuate or create a mood. “Stick out!” is our motto, and an appeal to share our philosophy. We say no to offensive and primitive slogans and choose subtle humor and bright colours. Our illustrators from all corners of Europe, South and North America create our unique designs for the whole family. When asked about it, I say I do not sell t-shirts. Which is partially true, since I actually know little about fashion and trends, and take little interest. Instead, for relatively small money I sell good mood, character and a message. All this is made in severely limited quantities, never to be reproduced! If our prints match your idea of a good mood, then we are on the same page! And, of course, Lucky Syrup products meet the highest quality standards established not by some mythical organizations but personally by me! I will be delighted to show you a hefty heap of specimen I tested and rejected after just a second wash. And, oh, almost forgot to mention – my family and I wear Lucky Syrup t-shirts, and this is saying something! Organizing sales at various markets and festivals, I had no idea how difficult it is to open a store in Berlin. If you divide all implicit and apparent problems by the area of 35 sq.m, minus all the sedatives consumed, you’d still come up with an impressive number of issues. Despite that, our small nook proudly called Lucky Syrup «Flagshirt» Store opened in 2018 at Reinhardtstrasse 3, 10117 Berlin. The main idea was to give our customers an opportunity, at their convenience, to see firsthand all the designs available, experience the mini-birthday environment we create for all who drop by. To experience foolery, extraordinary things and unconventional art – this is what we enjoy offering our visitors that for a moment become big children. And the hardest thing about it all is to grow up again afterwards – spoken from experience! POSTED BY Denis Lucky ON 2019-02-28, 14:00. POSTED BY Denis Lucky ON 2019-01-30, 17:00. POSTED BY Denis Lucky ON 2018-11-22, 13:00. We have a really jam-packed schedule in Noveber! POSTED BY Denis Lucky ON 2018-10-12, 14:00. Es ist uns unglaublich wichtig, ab und zu eure positiven oder kritischen Rückmeldungen zu bekommen. Hier sind ein paar meiner Lieblinge. Und was noch vieeeeel besser ist: suuuuuuuperschöööööööön! 😍 hab für meinen Bruder zum Geburtstag das irrelative rausgelassen. Ganzganzganz tolle Qualität und ein supersauberer Druck! POSTED BY Denis Lucky ON 2018-09-21, 14:00.